Promotional Material from Cinema Action’s Rocinante – found in the archive. Last week in the BFI’s Essential Experiments slot, William Fowler presented the work of the filmmaking collective, Cinema Action. 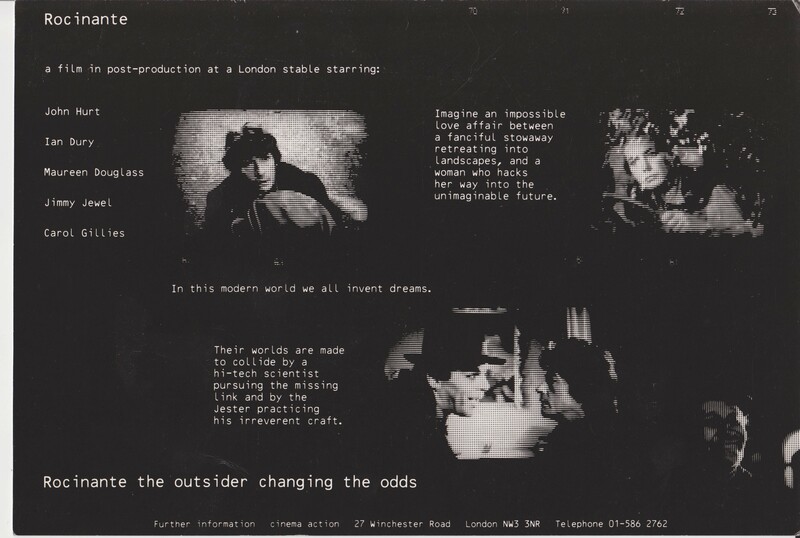 Two films were screen from the collective’s vast filmography – Squatters (1970), an attack on the Greater London Council regarding their lack of investment in housing . The film provided important – if controversial – information about the use of bailiffs in illegal eviction. And So That You Can Live (1981) which is widely recognised as one of Cinema Action’s finest works. The film follows the story of inspiring union convenor Shirley and the impact global economic changes have on her and her family’s life in rural South Wales. The landscape of the area, with all its complex history, is cross-cut with images of London, and original music from Robert Wyatt and Scritti Politti further reinforces the deeply searching, reflective tone. It was also broadcast on Channel 4’s opening night in November 1982. Cinema Action was among several left-wing film collectives formed in the late sixties. The group started in 1968 by exhibiting in factories a film about the French student riots of that year. 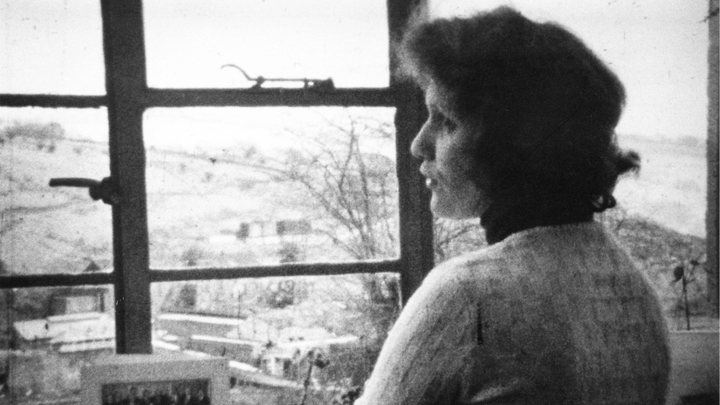 These screenings attracted people interested in making film a part of political activism. With a handful of core members – Ann Guedes , Gustav (Schlacke) Lamche and Eduardo Guedes – the group pursued its collective methods of production and exhibition for nearly twenty-five years. Cinema Action ‘s work stands out from its contemporaries’ in its makers’ desire to co-operate closely with their working-class subjects. The early films campaigned in support of various protests close to Cinema Action ‘s London base. Not a Penny on the Rent (1969), attacking proposed council rent increases, is an example of the group’s early style. By the beginning of the seventies, Cinema Action began to receive grants from trades unions and the British Film Institute . This allowed it to produce, in particular, two longer films analysing key political and union actions of the time. People of Ireland! (1971) portrayed the establishment of Free Derry in Northern Ireland as a step towards a workers’ republic. UCS1 (1971) records the work-in at the Upper Clyde Shipyard; it is a unique document, as all other press and television were excluded. Both these films typify Cinema Action ‘s approach of letting those directly involved express themselves without commentary. They were designed to provide an analysis of struggles, which could encourage future action by other unions or political groups. The establishment of Channel Four provided an important source of funding and a new outlet for Cinema Action . Films such as So That You Can Live (1981) and Rocking the Boat (1983) were consciously made for a wider national audience. In 1986, Cinema Action made its first fiction feature, Rocinante , starring John Hurt . …when I joined there was no question of making documentaries for television. We showed our films at left meetings, where we would set up a screen, do leaflets and so on. It is often hilarious. I remember showing a film on housing in a big hall in the Bull Ring area of Birmingham. It started with machine gun noises, and Horace Cutler, the hated Tory head of the Greater London Council, being mowed down. The whole place just stopped and looked, but, of course, as soon as you got talking heads, people arguing or living their ordinary lives, doing their washing or whatever, we lost the audience. I learnt something through seeing that. …Schlacke (Cinema Action co-founder) had a thing about the materialist dialectic of film. Somehow or other – and I can’t tell you how are why – this meant in every eight frames that you had to have a cut. Schlaker justified this was some theoretical construct, but it made his films totally invisible. After a time I just got fed up. James Scott, Humphry Trevelyan and I started The Berwick Street Film Collective and later went on to join Lusia Films. Find out more about the figures involved in Cinema Action and other British film collectives.